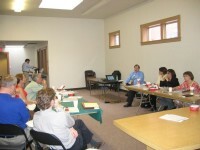 The Retail Support Strategies Task Force met with the University of Minnesota Extension Service this morning. As the group begins to focus on potential additions to Northfield’s retail mix, we thought it would be helpful to review the latest information on the community’s “Pull Factor”, or how well different segments of the city of Northfield’s retail sector pull in sales when compared with the per capita sales by category for the state of Minnesota. Joining Task Force members Ann Marie Boyle (The Art Store), Colleen VanBlarcom (McDonald’s), Margaret Haugen (U S Federal Credit Union), Norman Butler/Julie Bixby (Chapati/The Contented Cow), Rob Schanilec (By All Means Graphics), Sharon Vollbrecht (Quality Appliance), Kathy Feldbrugge (Chamber of Commerce) and me, were Mayor Lee Lansing, City Administrator Al Roder, EDA President Rick Estenson, Chamber President David Ludescher and NDDC Vice President Joe Grunhoefer. Northfield’s Pull Factor has shown a steady decline over the past 15 years. Some of this decline can be attributed to the changes in retailing and some of it can be related to our location within the expanding metro area. We’re hoping that we can get the City Council, the City Staff and the EDA to “sound the alarm” about supporting local businesses. They can certainly count on the determined assistance of the RSS Task Force. Would a campaign like this help? Dan turned me on to the “Keep Austin Weird” concept a few years ago. Sometime later, there was an article in “No Depression” magazine about it. I made an unsuccessful effort to get a bumper sticker for my car. Hey, are those two books in?